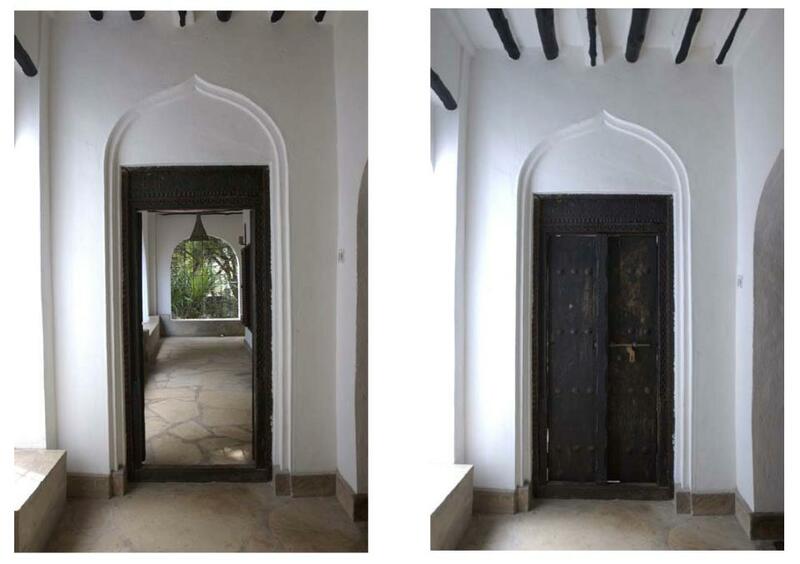 Neem House was designed and built in the traditional Arab/Swahili vernacular. 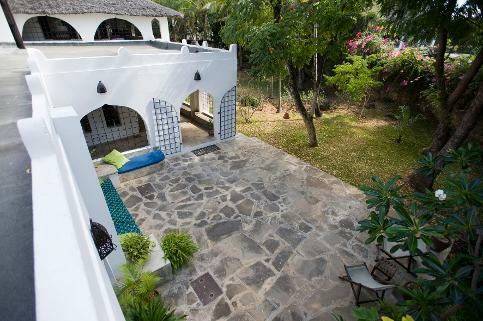 It is a private, family coastal residence in Malindi on the Kenya coast. 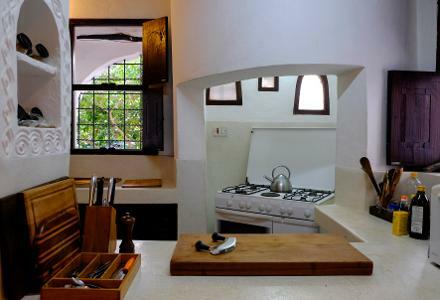 Affordable accommodation available throughout the year for vacation and holiday rental. 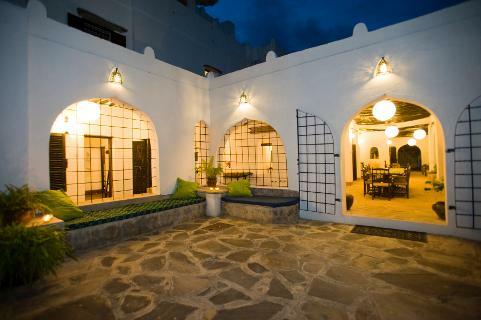 is situated on a coral outcrop catching the ocean breeze. 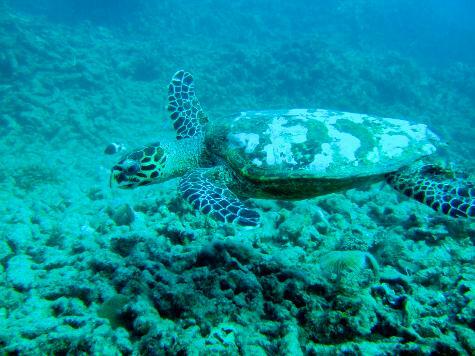 established in 1968, where glass bottom boats and snorkeling are available to explore the reef. 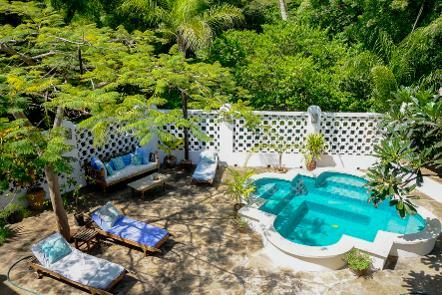 There is a beautiful pool at Neem House. 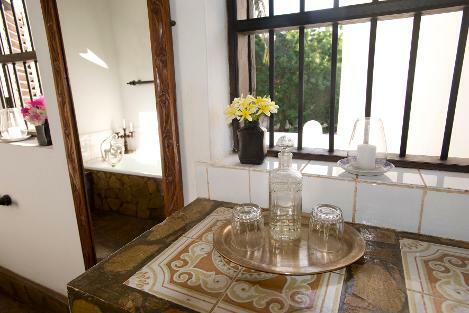 and is situated in a private courtyard. 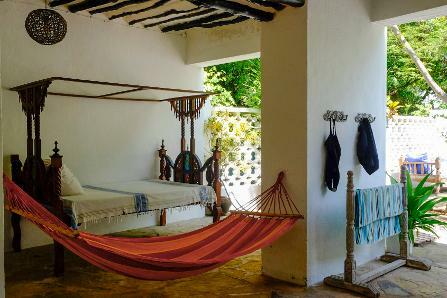 with day beds and a hammock. 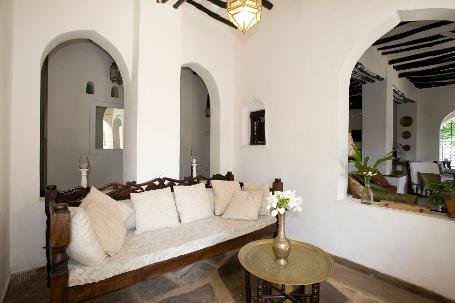 All rooms are large, spacious and feature Arabesque archways and antique carved doors from Lamu. with cane blinds or teak shutters, this creates a very open and cool living space. 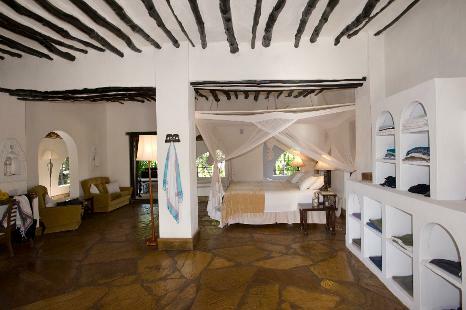 Ceilings, supported by traditional 'Boriti' poles are in excess of three meters. 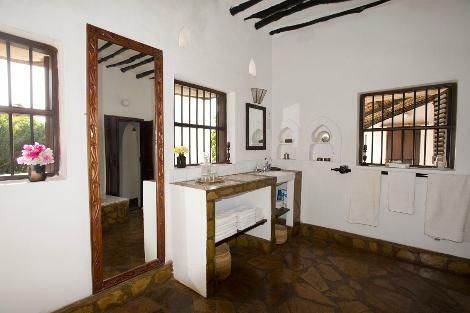 Floors are tiled with cool Galana stone, sourced from the Galana river, north of Malindi. All of the furniture is teak, designed for comfort on the coast. The 3.6m dining table comfortably seats twelve. 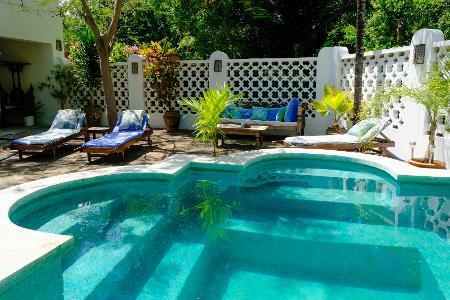 There are teak loungers and large traditional day beds around the pool and on the verandas. There are four bedrooms, three are en suite. 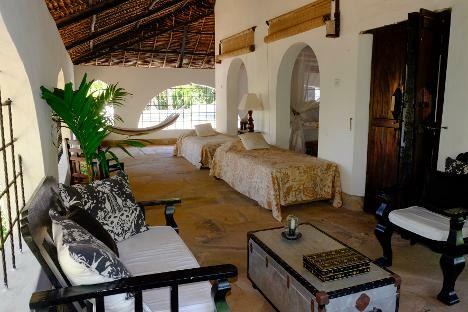 These all have overhead ceiling fans and large walk in mosquito nets. 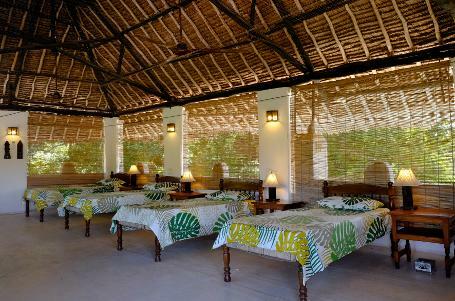 Neem House sleeps a maximum 12 people, perfect accommodation for family groups on holiday, vacation. two of the rooms can be converted to twins if required. 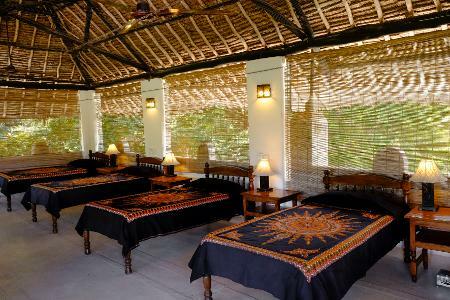 The remaining six beds are singles. 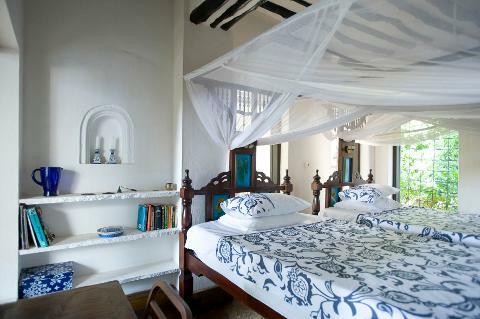 The fourth bedroom, containing four single beds, is a classic "Lamu style" room. 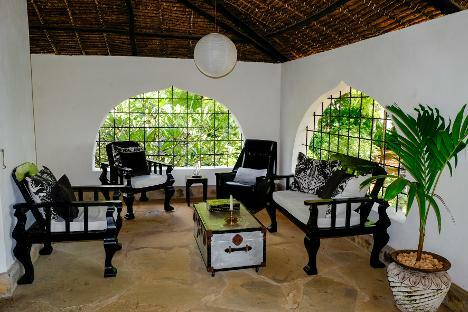 traditional Makuti roof and waist high perimeter walls. with sweeping views of the garden. Great for alfresco dining and barbequing. The traditional flat roof is over 100sq meters and sits just above the tree tops. 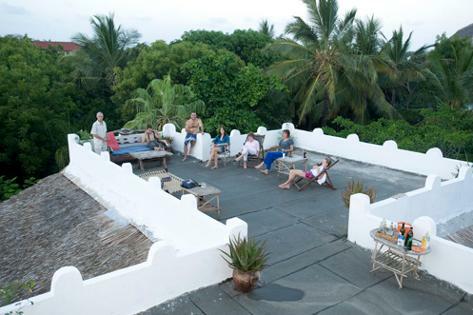 The views from the roof are breathtaking, particularly at sunrise and sunset and star watching at night is must. Water is mains supply although we do filter it for drinking. We have beautiful lanterns and candelabras throughout the house in case of power outages. These interruptions are usually brief, apparently due to the proximity of our house to both of Malindis' hospitals. in the courtyard by the pool. specifically for drinks in the kitchen and a smaller fridge on the landing upstairs. 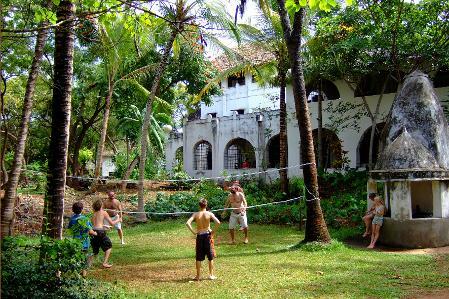 There are four members of staff at Neem House. 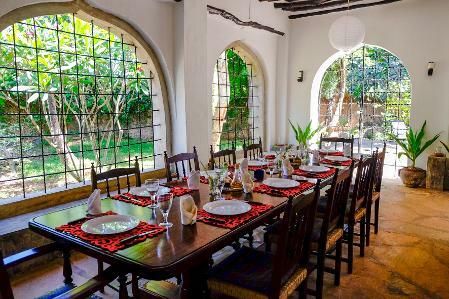 Charo, an experienced cook, produces classic Swahili dishes, refreshing salads and freshly baked bread. Purity is responsible for all housekeeping and laundry duties. in the evenings from 6pm to 6am. The house also has a monitored security system. Additional help in the house, Ayas' (nannies) and babysitters can be employed on a casual basis if required. Shopping is fun and hassle free. For groceries and supplies you can either pop into town in a Tuk Tuk, order buy phone and have it delivered or alternatively, you can request one of the staff to shop for you. If you would like a small preliminary shop done in advance please ensure we are given plenty of notice. Imported foods are quite expensive, however local fruit and vegetables are excellent quality and good value. and the people very friendly and welcoming. The butchery at the Italian supermarket is excellent if you tire from fresh seafood! Kenyan beer is very good and the wine is also reasonable. 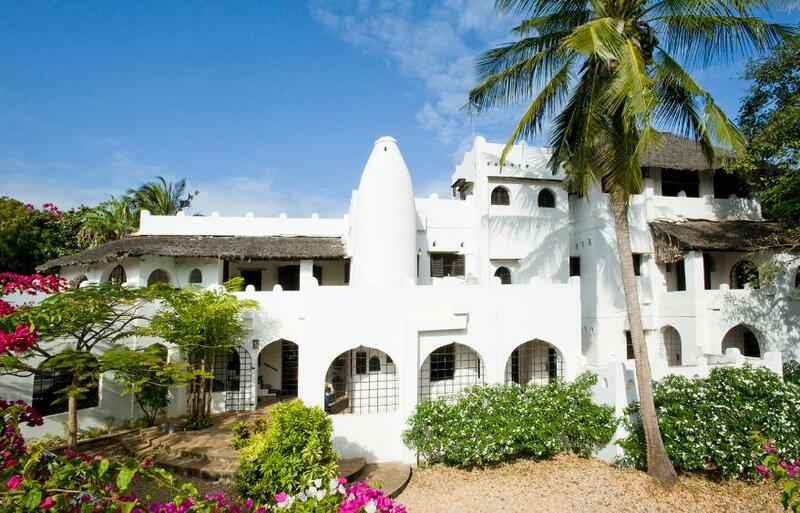 Malindi town has been a travelers destination for 4 centuries and has an incredibly interesting history. A classic African town, chaotic at times, real African mixed with Arab Swahili influences. Vibrant and full of colour. 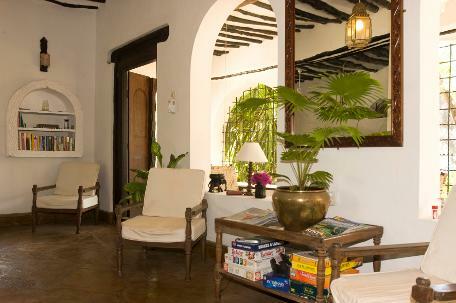 Malindi, Watamu, Gedi and Kipepeo, Kilifi, Lamu, Mombasa and the Tsavo National Park. 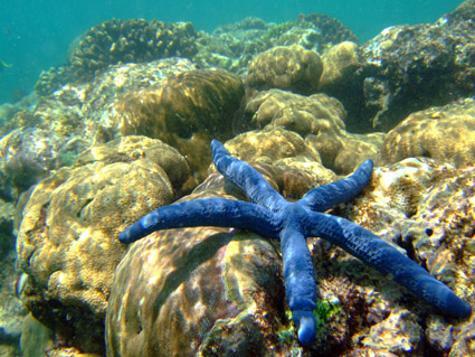 Diving and snorkeling in the Malindi and Watamu Marine Reserves is highly recommended. or the harmless Whale Shark who are regularly sited in the area. There are PADI registered dive centres in both Malindi and Watamu. Malindi is famous for big game fishing (tag and release). Sailfish, Blue Marlin, Black Marlin, Swordfish, Kingfish and Tuna are all plentiful. 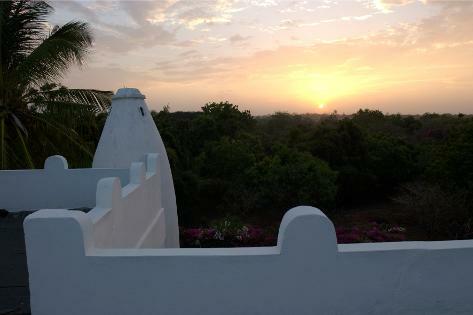 Safaris into East Tsarvo National Park, 100kms to the west of Malindi can be arranged. 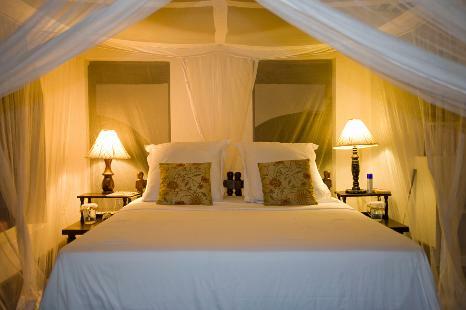 The classic tented safari camps are situated along the Galana river. Kipepeo butterfly farm is also well worth a visit. 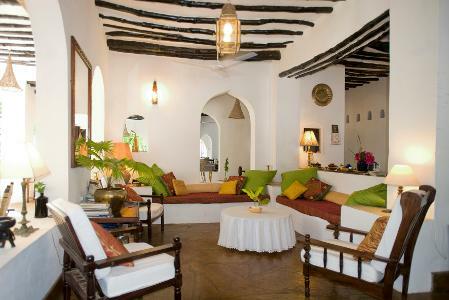 The numerous restaurants in Malindi are excellent thanks to the resident Italian and German influences. Local African style places are also very good. Nyama Choma (BBQ meat) and Swahili seafood curries in particular. 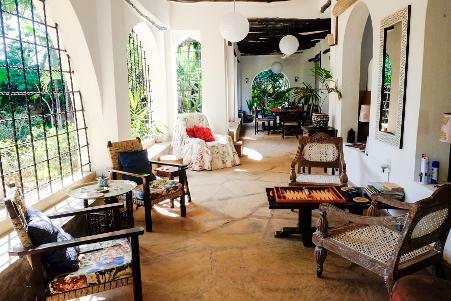 beaded leather sandals, bags and belts, soapstone carvings, locally made brass and glass light fittings. 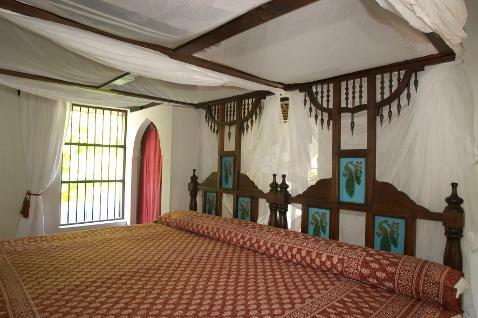 famous Makonde wood carvings, Arab and Swahili antiques. There are direct flights into Malindi via Nairobi. The airport is ten minutes from Neem House. A driver will collect you with our compliments. We look forward to you enjoying our home. 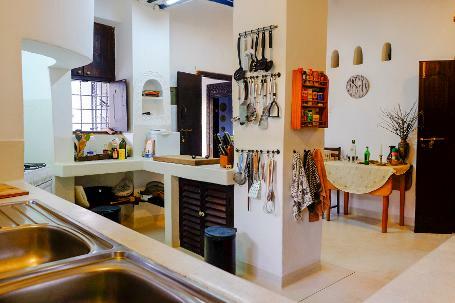 Neem House is available throughout the year on a daily, weekly or monthly basis. 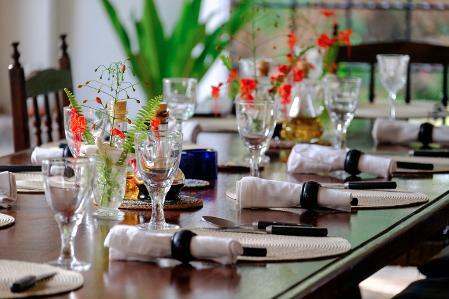 Rates are based on the number of guests, duration and season.